When we received the finished parlor furniture from Kevin at K-Craft, we were amazed! It is beautiful! Even though we still need to finish painting the wallpaper in our parlor (I only have the primer on) we excitedly set the furniture in place. First off, we couldn’t wait to see what it looked like in the room and secondly, Shon’s mom and dad, who gave us the pieces that had once belonged to his great-aunt Freda. Well, once we put the pieces in the room, I realized that the room needed a few other pieces to tie everything together. One being a plant stand – my idea is I’ll put a mirror behind it on the wall, so when people enter the parlor through our front door a beautiful plant or vase of flowers can greet them. 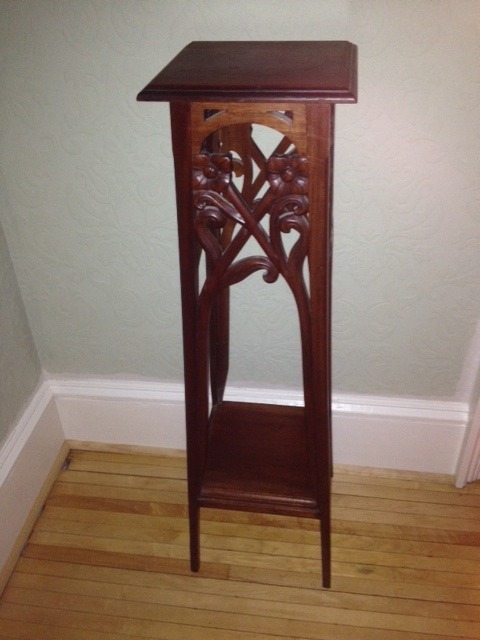 She walked over and showed me a very pretty plant stand that looked to have hand carved flowers in its woodwork, and was much more beautiful than the original one I selected. It was also $89. I asked if the owner would come down on the price and she said 10%. I then asked her how old she thought it was. She didn’t know, but said, “It does look old.” And, it did. So, I thought, “it’s beautiful, it will work, I’ll fork over the extra $50.” And, I did. Once Parker and I and the plant stand arrived home I eagerly pulled it out of the car, only to notice that a sticker on its underside read “made in Indonesia.” Eek! 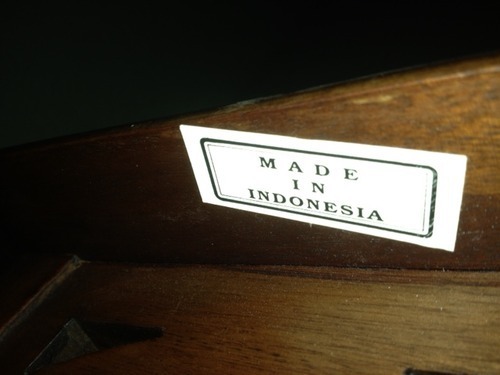 If I’d wanted a newly constructed plant stand made in Indonesia, I would have purchased it at World Market myself! AND probably for much less than $80. To my chagrin, the “antique” store has a no-return policy. Now, if I had been at a yard sale, a thrift shop or flea market, I would have checked the piece out more thoroughly to ensure it was old before purchasing. But, since this piece was in an “antique shop” I guess I didn’t see the need. The only good news is I do like the plant stand, and now I won’t feel guilty painting it. So, friends beware and look for tags when you’re hunting for antiques. 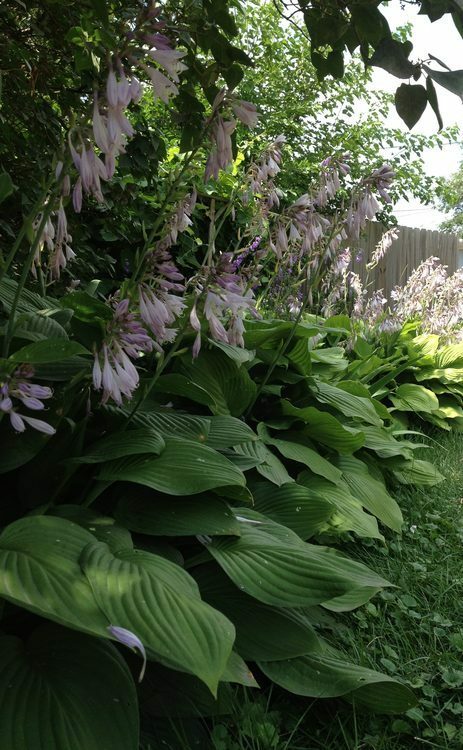 The nice thing about hostas, bulbs and other perennials is if you water them, they pretty much do the rest. However, until this summer, watering was a 2-hour nightly chore. Not that I minded it – after a day of work and mothering it’s a mindless duty, however, I could do a lot with 2 hours! Then, Shon suggested I put in soaker hoses. We found several feet of soaker hose at a yard sale a few summers ago for only $5 and it was just taking up space in our garage. Now, the challenge was getting it to work like I needed it to. Although soaker hoses are easy to install, because the purpose of a soaker hose is to leak water, and I was installing them in the perennial garden which borders our backyard, I needed to be crafty about providing source houses to the soaker hoses. It took me three evenings and four trips to Robson’s Hardware – but I finally got it working! So, this summer I simply turn on the soaker hose for 45 minutes and spend 30 minutes watering the other flower beds with Parker and the hose. After I finished installing the soaker hose I read a helpful article about the topic from SDSU Extension – it would have saved me some time. If you want to read an article written by an SDSU Extension expert on this topic, visit http://igrow.org/gardens/gardening/managing-vegetable-garden-water-needs-during-dry-weather/.